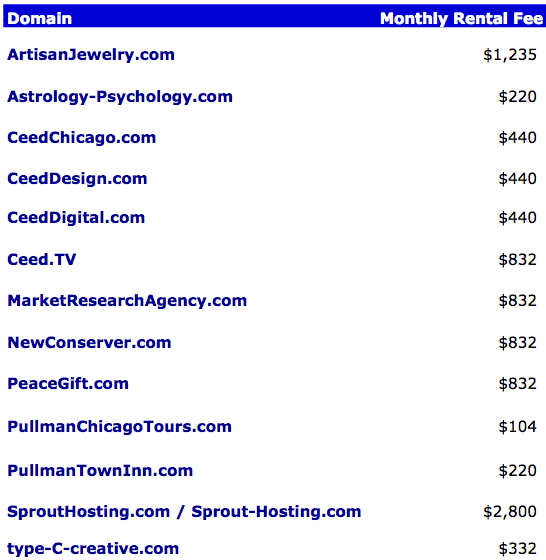 These domains can be leased monthly. Until leased, they may also be available for direct purchase. Generally the price is noted on the homepage of the listed domain. Ownership reverts to you after 20 consecutive years of leasing. A ten page starter site will be set up for you on request (optional) with a annual prepayment of your lease for the first year. For example, you could request this WordPress Install package – view details. Thereafter billing is monthly on an automated plan, or annually (10% discount when paying annually). Free basic hosting is included with the lease at the provider of our choice. Service upgrades or special work projects requested by the customer may incur additional charges. If you want to use your own hosting, generally you just need to send the correct nameserver addresses to us for updating. Also we can update the domain to work with your email hosting provider. If your needs are more complicated we can set up a co-managed domain registration account so that you have direct technical access. This will be done through an account at Sprout-Hosting.com.